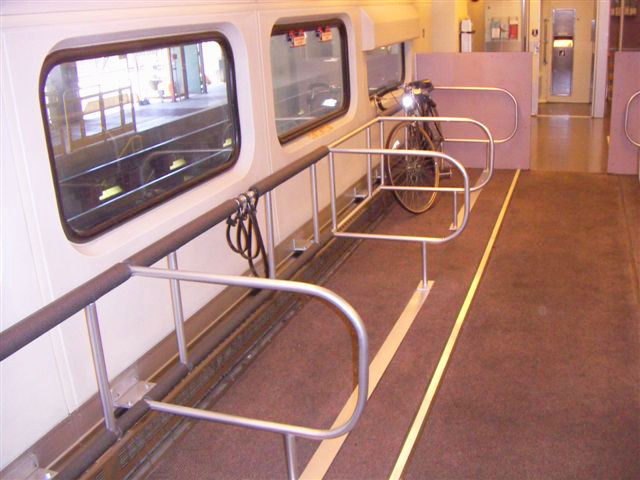 Earlier this week, The Source announced that it is adding a pair of bike cars to the Antelope Valley Inland Empire Line. While this is generally considered good news, even though some Source readers have some pretty valid concerns, I hate The Source’s picture. One bike, one lonely and clearly posed bike, alone on a giant car. To be fair to the Source, it’s not their picture. I know Streetsblog readers can do better, assuming we have any that ride the Antelope Valley Inland Empire Line, which is why we’re offering a free L.A. Streetsblog T-Shirt to the first reader to either get us a picture of many bikes using the cars or a picture of your bike using the car. Just send your pictures to damien at streetsblog dot org. We’ll announce the winner, and show off their picture, as soon as we get a winner. It’s starting on the Inland Empire line first. There’s no word yet on when it will start on the Antelope Valley line. When it does, I’ll take a photo for you. That picture is taken in the car barn. You can see the maintenance pit outside the window. Where did you pick up that the bike cars are on the AV Line? They are on the beach trains going from Riverside to Oceanside. Fix your incorrect posting! Now if we could get Amtrak to institute such a car that would be great. I know some on here would state that you can already take your bike on Amtrak services like the Capitol Corridor and the DownEasterner, but not on all services such as the Northeast Regional. I would be willing to pay up to $40 if they’d let me take my bike on the train without having to disassemble it and put it in a bike box. I’ve been wanting to start a petition for some time to encourage Amtrak to do such a thing, but lack the experience to do so. Also, I worry that Amtrak can’t afford to convert cars to all bike. Any thoughts on the matter? Photo Contest: Send Us Your Soggy, Snowy, Rain-Soaked Walk or Bike Ride!